‘History repeats the old conceits’ sang Elvis Costello on Beyond Belief and sometimes the Viconian cyclical view of history has, in hugely modified form, even its place in a record view. In 1965, accordionist Joe Burke, fiddler Andy McGann and pianist Felix Dolan recorded A Tribute to Michael Coleman for the Shaskeen label (much later reissued in CD format by Green Linnet). While the then 26-year old Burke had learnt his Coleman tunes from the playing of others and 78s, the older McGann (37 at the time) provided a direct link to the Sligo master fiddler. Andy’s parents were from Sligo themselves, emigrated to New York and ensured that their young son, once he had begun learning the fiddle, received lessons and guidance from their friend Michael Coleman. 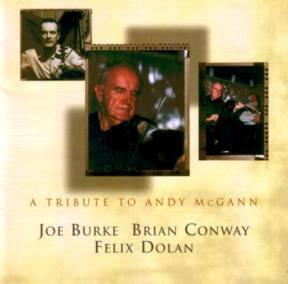 As such, McGann and Burke plus the former’s long-time friend Dolan were an ideal conduit for an album celebrating Coleman’s music (and one which thoroughly influenced a generation of young traditional musicians in both Ireland and the UK). Until his death in 2004 Andy, though seldom issuing commercial recordings, remained an icon of the Sligo style of fiddling. Chicago in April, 2006 witnessed a tribute concert to Andy McGann and there was perhaps nobody in the US more qualified to step into the late fiddler’s shoes as a member of that original trio than Brian Conway, himself a devotee of the Sligo style. The last four tracks on this impressive commemorative CD come from that particular concert while the remainder were recorded in a studio in Evanston, Illinois, apart from two solo Joe Burke tracks captured in his home town of Loughrea. And, as one might expect, this album is a veritably bouncy concoction, graced by plenty of tunes associated with either or both McGann or Coleman (including the usual concatenation of Bonnie Kate and Jenny’s Chickens) and blessed by sterling accompaniment from Felix, the rolling waves of Burke’s accordion (featuring his showpiece Bucks of Oranmore) and sublime fiddling from Conway, especially on the solo piece The Coolin/Fisherman’s Island. Enjoyment of the album is enhanced by a 24-page liner booklet, replete with photographs and informed by Jackie Small’s witty and incisive notes on the tunes, making this not just a worthy tribute to perhaps the finest of Irish-American fiddlers, but a definitive statement on the enduring influence of Coleman and his protégés. Oh, and Andy, does literally have the last laugh! For more information visit Cló Iar-Chonnachta.